This manuscript contains a variety of historical texts and other 'reference' works, such as notes on weights, and Arabic numerals. 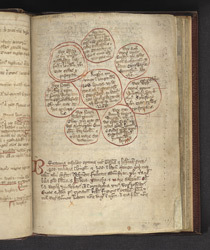 This diagram represents the Heptarchy (the seven kingdoms which made up Anglo-Saxon Britain). In each circle is written a short description of the territory of one of them. In the centre is a circle giving the overall dimensions of England; the southernmost point is given as Totnes ('Totenasse in Cornewall'), and the easternmost as Dover.